Learn more about VELETRI and what to expect with VELETRI. Pulmonary arterial hypertension (PAH) is high blood pressure in the arteries that carry blood to the lungs, which provide your blood with fresh oxygen.1 Once this oxygenated blood leaves the lungs, it goes back to your heart to be pumped out to all parts of your body, delivering oxygen and nutrients to your tissues and organs. 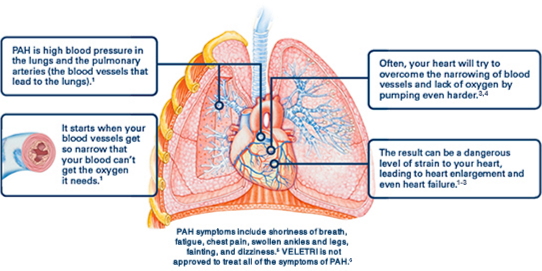 Symptoms of PAH are caused by a lack of oxygen due to narrowed blood vessels in the lungs and increased stress on the heart. Symptoms may not be obvious at first, but over time they can become more limiting. Get helpful resources about PAH. 2. Gomberg-Maitland M, Bull TM, Saggar R et al. New trial designs and potential therapies for pulmonary artery hypertension. J Am Coll Cardiol. 2013;62(suppl D):D82-D91. 3. Howard LS. Prognostic factors in pulmonary arterial hypertension: assessing the course of the disease. Eur Respir Rev. 2011;20:236-242. 4. McLaughlin VV, Archer SL, Badesch DB, et al. ACCF/AHA 2009 expert consensus document on pulmonary hypertension. J Am Coll Cardiol. 2009;53:1573-1619. 5. Brown LM, Chen H, Halpern S, et al. Delay in recognition of pulmonary arterial hypertension: factors identified from the REVEAL registry. Chest. 2011;140:19-26. 6. VELETRI® (epoprostenol) for Injection Full Prescribing Information. Actelion Pharmaceuticals US, Inc. July 2016.